1. First prepare the chicken by washing and cutting into small cubes. Drain in a strainer. 2. In a saucepan, heat up the coconut oil on a medium heat, and fry the fresh cumin seeds until they turn slightly darker. Be careful not to burn them as they do burn easily. 3. Add the salt, ground cumin powder, and if using chillies, add those too an fry for 30 seconds. 4. Add the chicken and stir-fry for 10-12 minutes until almost cooked. 5. Cut the mushrooms into halves and add to the chicken. Cook for 3-4 minutes. 6. Add a splash of soy sauce (about 1 level tsp) and cook until the sauce starts to dry up. 7. 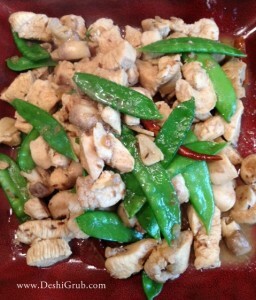 Once the sauce is pretty much dry, add the snow peas and cook for just one minute. You want the snow peas to remain crunchy. And that’s it! Enjoy!